Oh I LOVE the toy pics! I have a few new ones that I will post soon. I've actually started an album just for these pictures because they never cease to put a smile on my face. I love it--especially the fox laying on top of the monitor. I'm not the artist Bud is, but I definitely keep toys in my workspace. There's a small collection of Hamtaro hamsters, (yeah, I'm in my 20s and like Hamtaro. Deal with it) and Eric Cartman from South Park glares at me as if to say, "Get to work, you!" I have photos of setups I made, setups I made with my brothers, setups my brothers made alone or together, and one of my brothers still makes setups out of his toy knights (Britons), while another still collects and plays with - by making setups - Lego (he's married). 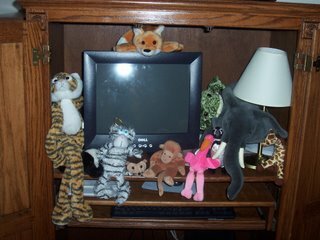 My aspie, Chris, has always made elaborate set-ups and dioramas of Legos, stuffed animals, etc. Now that he's in middle school, he's much praised for his artistic projects, which this term have included a 3-D depiction of the African savannah and a fully-populated medieval castle, both for social studies class. That's wonderful! And finding them on your computer must have felt like he had created a little gift for you. The way he has them set up kind of reminds me of a little shrine. computer monitors are NOTORIOUS for being dull. Kudos to the Bud-man for fixing that lil' problem for ya'!! hiya, i'm a 16 year old aspie, and i use to do thing like that all the time! I still do now, never relised it be abnormal though. I very muchly like to make things and then let a few people who i trust see them. I use to make castles out of my sisters benie babies. Now i mostly only deal in lego and lion, (lion is my best freind, heis a plushie but he understand me more than what my foster careerer do's) I recently got myself this lego set with all the elements for me to finnish building up my truck with working suspension. Currently, it has a 6 speed (and a reverse) gearbox to my own design, 4 wheel steering, a motor (hidden inder the seats, inside the chassis) and a knob on top to steer it with.